Did you know that far from being a barren, quiet season, winter is actually one of the busiest times in the world of garden landscaping? It’s a great time to think ahead to any improvements that you may wish to make to allow you to enjoy your garden not only in the warmer months, but all year round. During the colder months when the garden is looking a little barer than it would in the summer, it’s a good time to assess your landscape and work out if it’s missing any focal points. Often, focal points don’t have to be in the form of plant life; hardscaping is a good installation for the winter months. Think about installing trellises, an arbour, benches and other seating or even garden sculptures. By installing them in the winter, you’ll be able to assess how these aspects will look in future winters to create focal points when the rest of the garden is bare. Clearing leaves and other debris from pathways and patios, and mould and algae from wooden decking, not only makes walkways safer, but it also helps to prevent damage. Having your pathway, patio or decking professionally jet washed is a good idea, as this will clear the area and clean it at the same time. Once cleaned, repair any damage to prevent rot or cracking, and lift any sunken patio slabs and have them re-laid so that your patio is level again. Although you may not be able to actually carry out all of your landscaping jobs during the winter months, you can definitely plan ahead. For example, late autumn and early winter are great times to think about adding a spring patio, or a retaining wall, to your garden. Speak to specialist landscaping contractors now to get some quotes and advice on the work. You can even redesign your whole garden during the winter months, by working with a specialist landscape garden company, and then have the plans implemented once the cold weather starts to ease slightly. That way, it will be ready to enjoy during the summer! Check all of your garden fencing now and repair any warped, cracked or sunken fence panels and posts. You may need to have some fence panels replaced by a professional fencing company so that they withstand the harsh winter months ahead. During a clear, dry day, why not treat your fence with a protective preservative so that it’s ready for when the summer arrives? 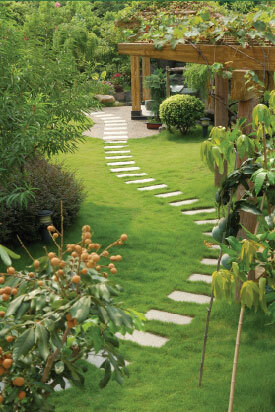 By carrying out certain winter landscaping jobs now, your garden will be prepared for when the warmer weather arrives. If you’re not sure what work should be carried out, speak to a professional garden landscape company for advice and a free quote. Your garden deserves to look good all year round, so why not start landscaping this winter?